Rockstar is making Grand Theft Auto V as authentic as possible - up to and including sourcing its voice acting to real gang members right off the street. Grand Theft Auto V will drop players into a dangerous world of vice and crime, and Rockstar wants that experience to be as authentic as it can possibly be (short of taking up bank robbery). To that end, when you hear the gangsters of Los Santos speaking, you'll be hearing the voices of "actual, real gang members" delivering lines in the same way they'd speak naturally. 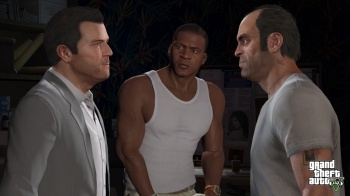 Contributing writer and in-game DJ "Lazlow" Jones says that Rockstar hired a specialist to find members of criminal gangs, "like El Salvadorian gang dudes with amazing tattoos, one of which had literally gotten out of prison the day before," to record lines. "We don't want a goofy L.A. actor who went to a fancy school trying to be a hard gang member," Jones says. "There's nothing worse than that, so just go find the terrifying people and say 'can you come in here please?'" Of course, just having realistic delivery doesn't mean much if the script isn't believable. The voice acting sessions were flexible, with the written lines often being discarded in favor of more natural dialogue from the "actors." "They look at the lines and say, 'I wouldn't say that,'" Jones explains. "So we say, 'Okay, say what you would say.'" Grand Theft Auto V will be delivering its authentic criminal experience with a worldwide release on September 17.